There's no shortage of high-tech sports shoes on the market which claim to improve an athlete's performance. 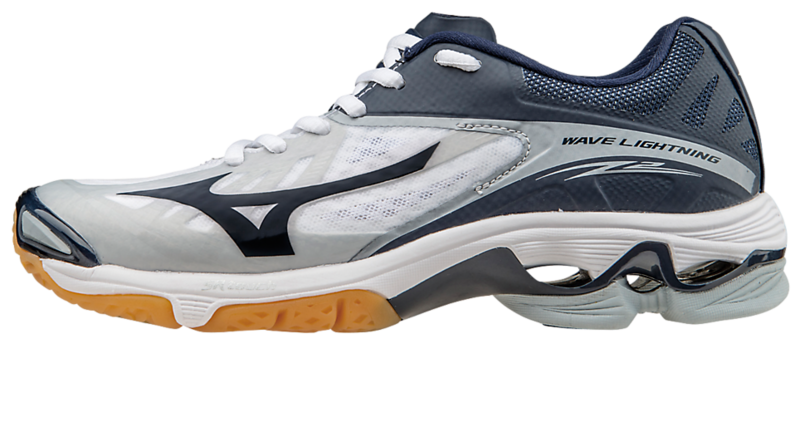 So why are we so excited to be adding the Mizuno Wave Lightning Z2 to our lineup? Well, despite being a relatively less-famous brand, Mizuno has been making major waves (so to speak) in recent years thanks to their innovative footwear and other training gear. They're looking to position themselves at the forefront of sports innovation, and right now, they've got a great start. We've had a chance to try out the new Mizuno Wave Lightning Z2 men's shoes, and they are a truly excellent option for indoor sports such as volleyball and basketball as well as running or jogging on concrete surfaces. Just one look at the Z2 tells you that you're looking at a different kind of shoe. The most prominent features are the split grooves carved out of the mid-sole and heel, which immediately suggest a lighter weight and superior flexibility. The Wave is so-named because the designers took their inspiration from nature, looking at how waveforms such as in sound or water spread out and disperse their energy. Those distinctive grooves are designed specifically to imitate these highly-efficient methods of energy dispersal, shifting the shock of impact across the bottom of the shoe while reducing the amount transferred into the athlete's foot and leg. We've tried very few shoes which deliver the same "shock absorbing" ability. Additionally, the grooves contribute to what Mizuno calls the "Intercool" system. They open up into the midsole of the shoe, encouraging warm\damp air to be expelled with every step. It's an excellent ventilation method, resulting in shoes which don't become uncomfortable during extended play, as well as discouraging the growth of mildew within the shoes. Plus, those grooves absolutely keep the shoes' weight down as well, further reducing their ability to interfere with play. Mizuno has also placed a real emphasis on comfort all around. The interior of the shoe was crafted specifically to adhere to a person's natural foot shape, increasing its grip on the foot. This is enhanced by their DynaMotion Fit system, which allows the interior of the shoe to flex and twist right alongside the motion of the foot. It fits snugly no matter what movement the athlete is going through, meaning fewer blisters as well as better support for fast movements. On top of that, Z2s are made with Extra Grade rubber, designed to provide extra traction on semi-slick surfaces such as a standard gymnasium floor. At the same time, they're guaranteed to be non-marking and are completely safe for any indoor use. In short, the Z2 line is a seriously impressive piece of wearable sports technology. They're some of the most comfortable indoor athletic shoes we've tried, and you really can feel the shock-absorbers working with every stride. SquadLocker carries a wide variety of colors and, of course, as with all our products they can be fully customized with your team logo and other livery. If you're looking to put a men's basketball, volleyball, or other indoor court team together with the best possible footwear, Z2s would be an excellent option. To learn more, contact us with your questions or just go ahead and start building your own team store!